I really can't be bothered to leave the apartment to go buy baskets to store all of these, so their current home is in the middle of the living room floor. And, as there is no one to complain about it, there they shall stay for the time being! But seriously. . . any suggestions? How do you sort / store / use your scraps? Is this a completely futile endeavor? Finish It Friday: Wedding Quilt DONE! Check it off the list, ladies and gents - - - Kate's Wedding Quilt is officially DONE! 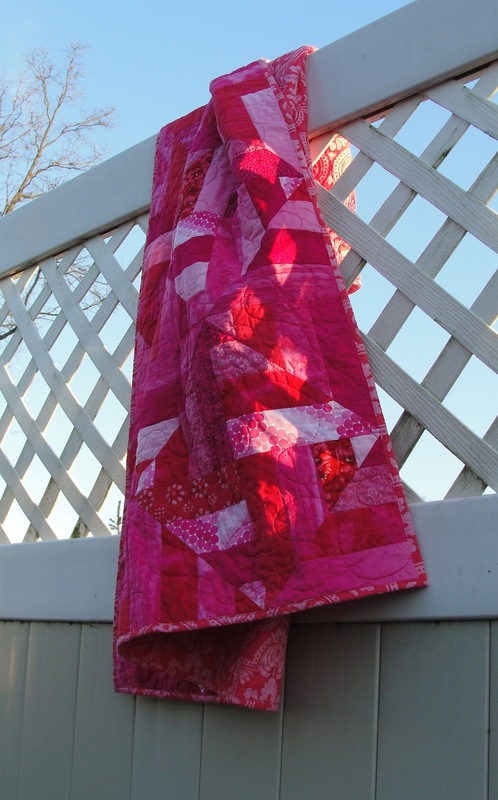 Quilted, bound - even washed for crinkly deliciousness! I quilted it with a wide meander, and bound it with (shocker) hot pink fabric. I went ahead and washed it because I don't want the recipients to feel like they can't use it. Wash it, dry it - use it! Ok, I caved in and am now officially "swooning" - - - and I LOVE IT!!!!! 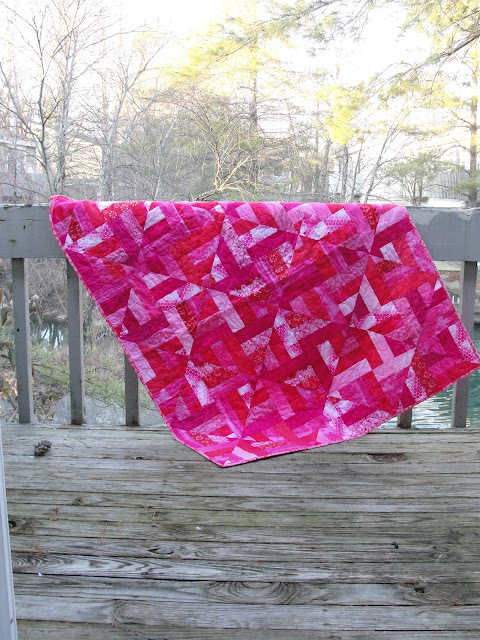 If you haven't seen the pattern, the Swoon Quilt was designed by Camille Roskelley (pattern found here). There's even a Swoon-Along hosted on Flickr, so head over there for lots of photos of other folks' beautiful Swoons. 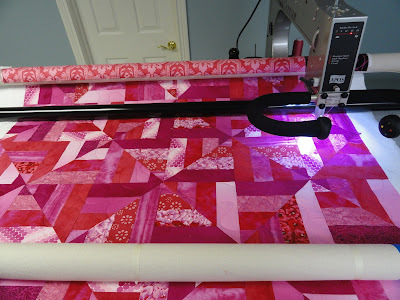 When I saw the Swoon Quilt in person at a Cincinnati Modern Quilt Guild Meeting (courtesy of Christy), I fell a lot in love. I just haven't been able to get it off my mind, I've been cyber-stalking other peoples' progress, I find myself thinking about it when I'm driving to work, I wonder why it hasn't called and asked me out to a sensible movie - - - all the signs of a quilt crush (and possibly a disturbed mind). 1 block down, 8 to go. I have to say, I was afraid I'd find this block to be SUPER tedious given that each large block has a total of 45 interior-blocks (and even more pieces if you count up all the HSTs and flying geese). But it's been really fun so far, and not tedious at all! The instructions are very clear and, so far, completely accurate. Have you already started on your own Swoon quilt? I'd love to hear how you're getting along! I can't believe it's taken me so long, but I've finally joined an online block swap through Flickr. It's the NuBees Swap (click the button in the right side bar to see the photo stream). There are a ton of talented people involved, and it's really inspiring to see all the color combinations and amazing blocks that people are coming up with. This is a month-by-month swap, so you don't have to commit yourself for an entire year, which for those of us who are terrified of committing to as much as a cable contract, it works perfectly! 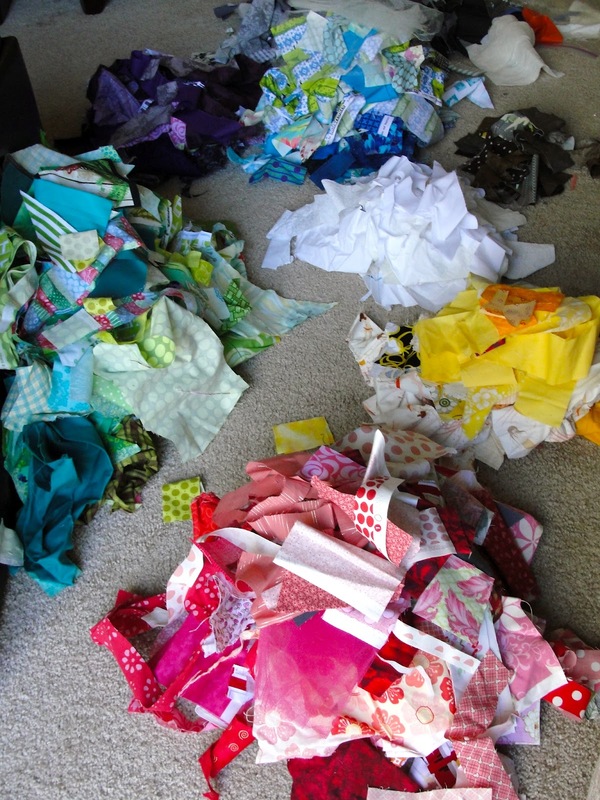 :-) Each participant gets to choose their color palette, but the maker chooses the fabrics and the pattern. At the end of the month, I'll mail each of my teammates a block, and I'll get one from each of them in my colors of choice (gray and white). One of my absolute, all-time besties — otherwise know as Kate, K8 and sometimes Kate-Monster — got married over the summer and I just couldn't give my friend anything other than a quilt for the big event. And I'm finally almost finished. Seven months after the fact. 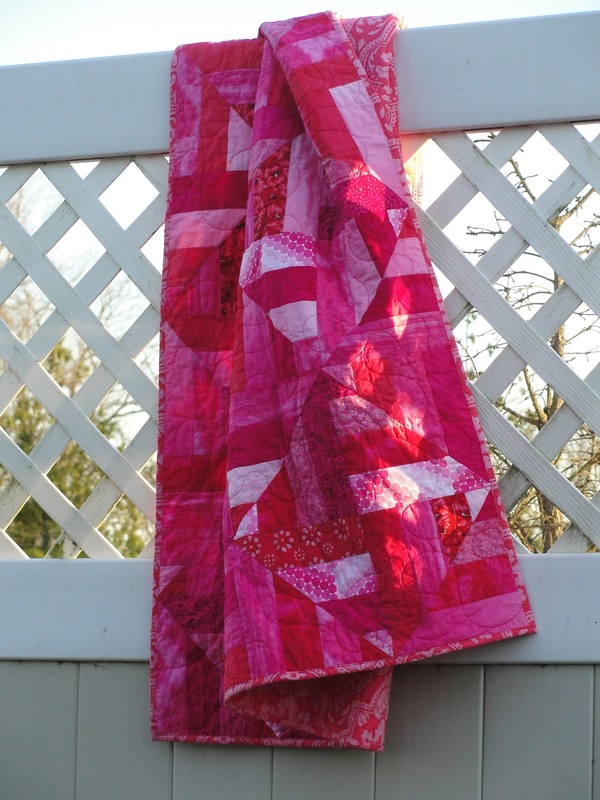 I used the Strip Twist Pattern to make this red and pink quilt, and I really think it came together well. I love how the diamond shape pops out, but the block is really a square set straight, not on point. Check out the pattern link to see what I mean. I've gotta' tell y'all, this is a fantastic quilt to make with scraps, and it's really really fast and easy to make. For realz. Next up: quilt and bind it! Hopefully I'll have some more pix soon of the absolutely finished, 100% done Kate Kwilt!